Create a quick and easy downloadable personalised calendar for 2019, that you can print at home! Add your favourite photo and a caption and make your own calendar free. This free photo calendar is downloaded as a PDF and is perfect for A4 or A3 print. Underneath your chosen image, the rest of the calendar features all the months of the year, with days of the week clearly indicated. Build your own calendar with your uploaded your image and caption, and then simply click the download button and enjoy your free personalised calendar. Thank you for using free calendar. If it doesn't open in 10 seconds, click the link below to try again. If you need a free photo calendar in a hurry, then this free, downloadable calendar is for you. Our simple yet stylish design allows you to create a free personalised calendar and print it immediately in the comfort of your own home. Make your own calendar free using a special photo, and add a caption to make it even more personal. The downloadable PDF is perfect for A4 and A3 printing; just make sure you use a high-quality printer and inks to get the most out of your calendar. Underneath your chosen photo, you will see the months of the year printed in full, with a handy days-of-the-week indicator. There is no limit to printing your own calendars (apart from the ink in your printer of course), so you can enjoy printing as many calendars as you like, with different photos every time. Make your own calendar, free, as many times as you like, with a different image every time. 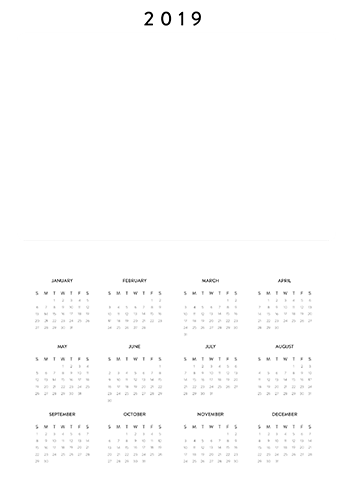 Our unique, printable template can be downloaded again and again with a different photo and caption used each time so that you can print your own calendar as well as a photocalendar for your friends and family. This is perfect if you want to put a calendar in several rooms in your house, or for every desk in your office. Why not print a calendar for each of your children, using their favourite photo? Teach them about the months of the year and days of the week in a fun and personal way. These calendars can act like a personalised and functional poster, that they will love hanging up in their rooms.